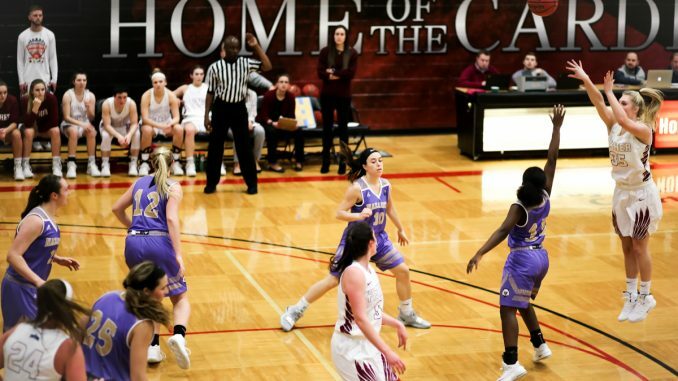 St. John Fisher’s men’s and women’s basketball teams both fell slightly short of a victory against their rival Nazareth College in a sold-out home game. The teams were met with an energetic crowd on Tuesday Jan. 22 for the Battle of the Beaks, a fundraiser for Golisano Children’s Hospital. Both teams fell 4 points short of beating the Golden Flyers, keeping the crowd on their feet until the end of the game both times. The losses made both the men’s and women’s teams records fall to 10-6. Fisher started the game strong, with a steal by Junior Alex Reigle that gave freshman Ella Eckert the opportunity for a layup. Nazareth was able to respond with two jumpers, while a rebound from Reigle gave Fisher the opportunity to tie the game. The score remained close until a three-pointer from Naz’s Lizzie Straub and a free throw put Nazareth head 10-6. Fisher reacted with two three-pointers, one by sophomore Olivia Baumann followed by another from freshman Miranda Lynch, that tied the game 12 all. Nazareth pulled ahead after a steal gave Erica Bradley an open shot. A foul on Fisher allowed Bradley to increase Fisher’s deficit to 16-12 at the end of the first quarter. Fisher was quick to regain the lead in the second quarter, starting with a layup from Baumann and a jumper from Eckert that tied the game. Freshman Julia Mertsock gave Fisher an 18-16 lead after making two free throws. However, the Golden Flyers were quick to retake the lead after a steal and assist from Miyah Sizer gave Bradley an open shot for a three-pointer. A layup from Fisher sophomore Sydney Masna kept the score close, but some layups and points from the line on Nazareth made the score 27-22 with 2:45 remaining in the half. A rebound by Eckert helped sophomore Elle Lazore to score Fisher’s last field goal in the half, while back-to-back layups from Nazareth’s Rachel Benedict made Fisher trail 31-24 at the half. Bauman was Fisher’s top scorer in the half, with 5 points, while Reigle totaled 5 rebounds and two steals. n some offensive rebounds and steals on Nazareth turned into opportunities for layups. Nazareth created a 10 point deficit for Fisher when Bradley made two points from the line. Mertsock responded by stealing the ball and making two free-throws of her own, followed by a jumper, with 2:16 left in the quarter. Another jumper from senior Erin Hulbert and a free throw from Reigle left Fisher trailing by only 6 points going into the fourth quarter. Fisher returned with two layups from Eckert, making the score 37-43. With 5 minutes left on the clock, Baumann made an assist to Eckert to keep the score close, but a layup from Nazareth’s Rachel Benedict gave the Golden Flyers a comfortable 7-point lead. As the clock would down to the 2 minute mark, Mansa fouled out and Bauman was subbed out due to foul trouble. 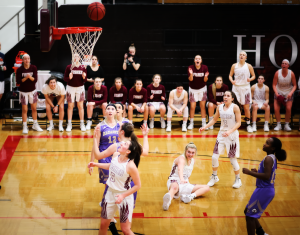 Despite this, Fisher was able to stay close to Nazareth, thanks to a layup from Eckert and a three-pointer from Reigle, making the score 45-51 with 27 seconds left. Two free throws from Mertstock and a three-pointer from Hulbert set up a thrilling two-point game for the last couple of plays. After two Fisher fouls to stop the clock, Nazareth pulled ahead by two points. The Cardinals were unable to find open shots to match Nazareth’s free throw shooting, making the final score Fisher 50-Naz 54. Eckert was Fisher’s highest scorer 12 points, while Baumann totaled 7 points and Hulbert lead in rebounds. Three Nazareth players players scored in the double digits, including Benedict with 17. Fisher started the first five minutes of the game neck and neck with Nazareth. Naz’s Daniel Jacob had the first score of the game by nailing a three-pointer, matched by another three from Fisher junior James Leone. Nazareth was quick to retake the lead with a jumper, but a rebound and layup by senior Dylan Harrington made the game 5-5. Eight minutes into the half, Fisher took the lead when Harrington found an open shot for a three-pointer. 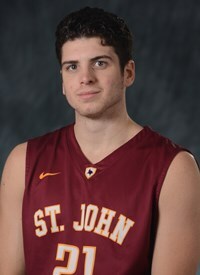 Fisher extended the lead to 12-9, when sophomore Mark Valeriani made an assist to Leone to knock down a shot. Nazareth created a one-point game at the 10 minute mark, after grabbing some offensive rebounds to set up shots from the paint. 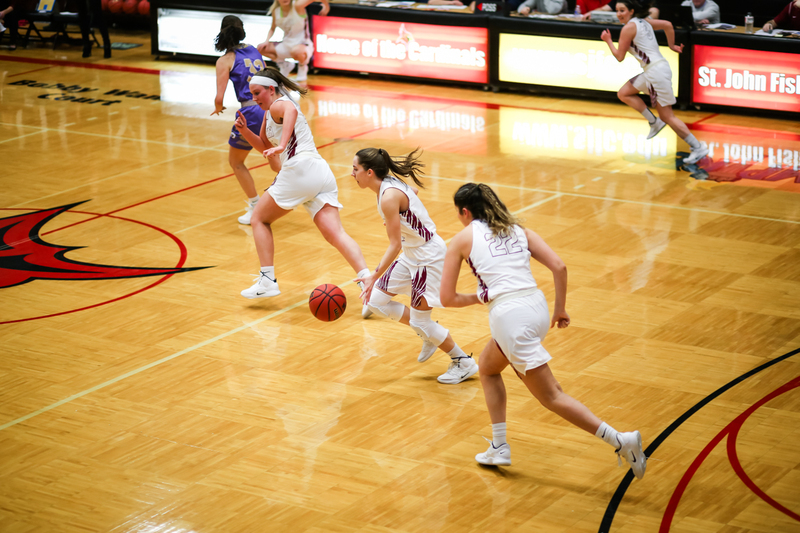 However, Fisher was able to extend their lead after making a series of three-pointers, including one from senior Jordan Gilman to give Fisher a 29-22 edge. Nazareth was able to tie the game at 39 with 2 minutes left in the half, despite some points and assists from Fisher freshman Sean Williams. After some missed three-point attempts by Fisher, Nazareth was able to take the lead by four points. Henderson was able to minimize the damage to a two-point deficit when he found an open layup opportunity with 10 seconds left, making the score 41-43 at the half. Harrington and Williams were the Cardinals’ top scorers in the half, with 8 points each. Fisher was quick to retake the lead at the start of the second half after a series of layups and a three-pointer from Leone that gave the Cardinals a nine point run. The Golden Flyers were able to close the gap after a three-pointer plus free throw by Cody Green resulted in a four-point play. This helped to give Nazareth the momentum for an 11 point run. Fisher began closing the 54-60 gap with 11 minutes left on the clock by earning points at the line and with the help of a three-pointer from sophomore Louden Porter, creating a thrilling two point game. Nazareth was able to answer with a quick rebound and drive from Chris Jones and continued to possess the ball to create a 64-72 deficit for the Cardinals. Some missed shots by Nazareth and rebounds give Fisher sophomore Matt Asenjo and Williams the opportunity to close the gap. With 2:30 left on the clock, Williams tied the game when he stole the ball from Nazareth to drive for a layup, making the game 76 all. However, Nazareth picked up momentum with the clock winding down starting with a deep three-pointer from Stephen Gabel. Another three-pointer and some points from the line gave Nazareth an 85-79 edge over Fisher with just a minute to play. A layup and a free throw from Leone gave Fisher fans hope by setting up a three-point game. However, Fisher was forced to foul to stop the clock, which gave Nazareth’s Brendan Wind an opportunity to score a point. A quick layup by Leone made for a thrilling 84-86 score with 5 second left. Fisher’s hopes of victory were shattered when Nazareth’s Jake Burgio made both of his free throws, leaving the final score of the game Fisher 84-Naz 88. Leone came out as Fisher’s top scorer of the game, with 19 points as well as 10 rebounds, while Henderson, Williams, and Harrington all scored in the double digits. Nazareth’s top scorer was Burgio with 23 points.